"The stock certainly could rally in the short term, but more importantly I really think Nike is one of these unique brands that is truly one of these stocks for a lifetime," Schlossberg said on CNBC's "Trading Nation" on Monday. "It has such a dominant position in the performance of the shoe and apparel field right now. It basically dominates almost every single major sport." Nike posted more than $35 billion in sales last fiscal year, above the roughly $26 billion reported by its next top competitor Adidas, according to FactSet. "Nike as a long-term hold is one of the easiest bets to make," said Schlossberg. "It has a very strong chance to go to $100 in the next 18 to 24 months and it performs pretty much on all cylinders, and its portfolio approach to essentially owning all the top athletes in all the major sports definitely makes it almost indomitable as an equity play." 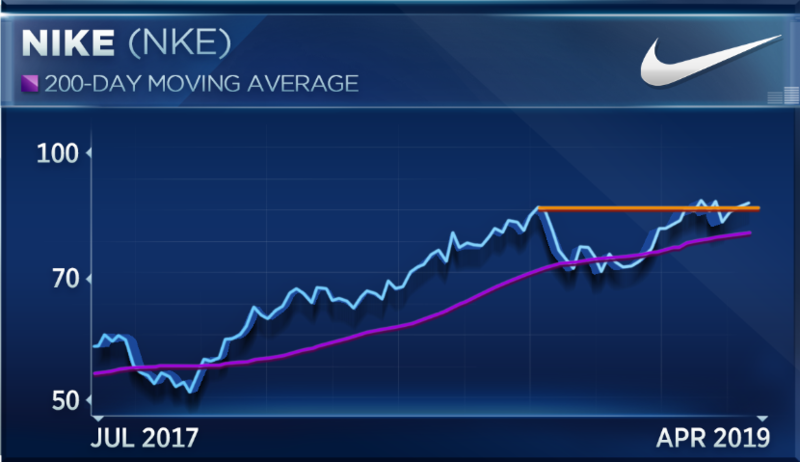 First the Nike must break out from a key level, says Ari Wald, head of technical analysis at Oppenheimer. "The stock has been oscillating around an important level at $86. This marks the stock's September 2018 peak," Wald said on the CNBC segment. "We're arguing for the definitive breakout to new highs." Nike is 2 percent from its all-time highs set in March. The stock has rallied 30 percent over the past 12 months. "There's a positive trend going into this test, the stock has been making higher lows for a number of years. It still scores high in our momentum work. It's been showing leadership characteristics, so we think it's a stock that should continue to be owned and it should trade higher," said Wald.